Usually black and tan. It is short, sleek, and shiny. This dog is high-spirited, intelligent and cunning. It only barks in times of danger. This dog is high-spirited, intelligent and cunning. It only barks in times of danger. They get along well with children, but may try to dominate other dogs. This breed needs to get used to cats and other household pets at a young age.They make excellent watchdogs. You can find Manchester Terrier puppies priced from $900 USD to $900 USD with one of our credible breeders. Browse through our breeder's listings and find your perfect puppy at the perfect price. They get along well with children, but may try to dominate other dogs. This breed needs to get used to cats and other household pets at a young age.They make excellent watchdogs. Dead and loose hairs should be removed with a rubber brush. Ears need to be kept clean, and claws must be kept short. The Manchester Terrier learns quite quickly. It does well in obedience trials. This breed demands plenty of exercise. Regular daily walks, as well as opportunities to run and play off the leash are necessary. Manchester Terrier Puppies for Sale - Shipped Worldwide! Finding the right Manchester Terrier puppy can be dog gone hard work. PuppyFind® provides a convenient and efficient means of selecting and purchasing the perfect Manchester Terrier puppy (or Manchester Terrier puppies) from the comfort of your home, 24 hours a day, 7 days a week. Take advantage of our PuppySearch or leisurely browse our directory of hundreds of dog breeds, Manchester Terrier dog breeders, Manchester Terrier dogs for adoption, and Manchester Terrier puppy for sale listings with photos and detailed descriptions. Some Manchester Terrier puppies for sale may be shipped Worldwide and include crate and veterinarian checkup. 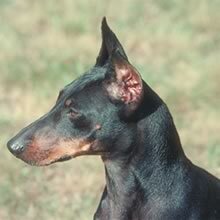 Many Manchester Terrier dog breeders with puppies for sale also offer a health guarantee. With thousands of Manchester Terrier puppies for sale and hundreds of Manchester Terrier dog breeders, you're sure to find the perfect Manchester Terrier puppy.